This article is about the Irish band. For the Japanese visual novel franchise, see Clannad (visual novel). For other uses, see Clannad (disambiguation). The original line-up in 2007 at the Meteor Ireland Music Awards. Clannad (Irish pronunciation: [kl̪ˠan̪ˠad̪ˠ]) are an Irish family band formed in 1970 in Gweedore, County Donegal. Their music has been described as folk, folk rock, traditional Irish, Celtic and new-age, often incorporating elements of smooth jazz and Gregorian chant. Formed by siblings Ciarán Brennan, Pól, and Moya Brennan and their twin uncles Noel and Pádraig Duggan, the band were initially known as Clann as Dobhar; in 1973 they shortened their name to Clannad. By 1979 they had released three albums and completed a successful US tour. From 1980 to 1982, they recorded and toured as a six-piece group with Enya on additional keyboards and vocals, before she left the group to pursue a solo career. In 1982, Clannad attracted international attention with their hit single "Theme from Harry's Game", which was included on Magical Ring (1983). They adopted a musical direction of Celtic and pop music in the 1980s and 1990s, as evident on Macalla (1985), and Anam (1990). After Landmarks (1997), the band were on hiatus before the original line-up reformed in 2007 before a four-piece of Moya, Ciarán, Noel, and Pádraig completed a full-scale tour in 2008. They then released Nádúr (2013), their first studio album in fifteen years. Pádraig Duggan died on 9 August 2016. Clannad have won numerous awards throughout their career, including a Grammy Award, a BAFTA, an Ivor Novello Award, and a Billboard Music Award. They have recorded in six different languages, and scored eight UK top-10 albums. They are widely regarded as a band that have brought Irish music and the Irish language to a worldwide audience, often experiencing more popularity abroad than in their native Ireland. Clannad was formed in 1970 by siblings Ciarán Brennan, Pól, and Máire Brennan and their twin uncles Noel and Pádraig Duggan. The five grew up in Dore, an area of Gweedore, a remote parish in County Donegal in the northwest corner of Ireland. It is a Gaeltacht region where Irish is the main language. Raised as a Roman Catholic family of musicians, the Brennans' mother, Máire "Baba" Brennan (née Duggan), was a music teacher while their father, Leo Brennan, was a member of the Slieve Foy Band, an Irish showband. Later in their careers the two bought and ran Leo's Tavern, a pub in nearby Meenaleck where the Duggan and Brennan children would perform covers of songs by the Beatles, the Beach Boys, and Joni Mitchell. The band adopted the name Clann as Dóbhair, Irish for "The Family from Dore", when they entered a local music competition, and they used that name until 1973. The Brennans' and Duggans' interest in traditional Irish music reached beyond their native Gweedore,[clarification needed] and they performed elsewhere including Tory Island, off Donegal's coast. Armed with some 500 Gaelic songs, they would later begin to arrange these songs for a full band. A sample of "Liza" from Clannad (1973), the first song that Clannad wrote. In 1970, Clannad signed a recording contract with Polydor Records after they came first in the annual Letterkenny Folk Festival. However, the label initially refused to release their music as they had little faith in their proposed album with songs sung in English and Irish. Their debut album, Clannad, was recorded at Eamonn Andrews Studios and is formed of arranged Irish songs, including a cover of "Morning Dew" by Bonnie Dobson, and original material. Following the album's release in 1973, Clannad took part in the heat stages of the 1973 Eurovision Song Contest for Ireland with "An Pháirc" from Clannad as their entry. The band released Clannad 2 as their second studio album on Gael Linn Records in 1974. To produce the album the band hired Dónal Lunny, founder of the Irish bands Planxty and The Bothy Band. Like their first release, Clannad 2 features a mixture of English and Irish songs, this time with Lunny and Bothy Band members on additional instruments. Clannad released their third album Dúlamán in 1976. The album is named after the Irish folk song "Dúlamán" which became a fan favourite at Clannad concerts. Dúlamán was recorded at Rockfield Studios in Wales and is their first album produced by Nicky Ryan. They supported Dúlamán with their first tour of Europe which they completed in 1976, during which a standing ovation they received after an extended rendition of "Níl Sé'n Lá" convinced them to continue with Clannad full-time. Dates from their 1978 tour of Switzerland was released in the following year as Clannad in Concert. Also in 1979, Clannad underwent a 36-date tour of North America, the most extensive by an Irish band at the time. In 1980, Clannad became a six-piece band following the addition of Enya Brennan on keyboards and additional vocals. Ryan wished to expand the group's sound with vocals and electronic instruments and invited her to join. Enya's first recordings with the group were made as a guest musician for their Crann Úll (Irish for Apple Tree), their fifth studio album recorded in Cologne, Germany and released in 1980 on Tara Music. "Ar a Ghabháil 'n a 'Chuain Domh" featured a particularly full band arrangement reflective of their live jams at the time. "Lá Cuimhthíoch Fán dTuath" showed the first hints of the more atmospheric side of the band's arrangements. By the time Clannad entered Windmill Lane Studios in Dublin to record Fuaim (Irish for Sound), Enya had become a full-time member. The album displays the group's further experimentation with electronic instruments, and Enya is featured on lead vocals on "An tÚll" and "Buaireadh an Phósta". Neil Buckley plays the clarinet and saxophone plus Noel Bridgeman on percussion and Pat Farrell on electric guitar. Fuaim was released by Tara Music in 1982. After a further European tour, their managers Nicky Ryan and Roma Ryan left the group. Nicky had brought Enya into the group to expand their sound, yet the group soon settled into their "boring" musical formula once more and called a meeting during the tour. After a group vote, the Ryans split. Enya followed suit, feeling increasingly restricted in a band setting and pursued a solo career with the Ryans as collaborators, causing a rift between the two groups for a short time. The song that introduced Clannad to a worldwide audience. Hit song from their 1984 album Legend. In 1982, the now five-piece Clannad signed to RCA Records. They then accepted an invitation to record a song for Harry's Game, a three-part television drama depicting The Troubles in Northern Ireland. Ciarán, Pól, and Máire got together and wrote "Theme from Harry's Game". The song became a commercial success upon its release as a single in October 1982, peaking at number 2 in Ireland and number 5 in the UK. It remains the only UK hit single to be sung entirely in Irish. From 1983 to 1987, rock band U2 used the song at the end of every concert. Following their newfound success with "Theme from Harry's Game", Clannad included the song on their seventh studio album, Magical Ring, released in 1983. The single and album marked the start of their international career, and Magical Ring became their first to be certified gold by the British Phonographic Industry (BPI). After Magical Ring, Clannad were commissioned to score the 26-episode drama series Robin of Sherwood, aired from 1984 to 1986. They once again began to stretch themselves, creating music for a range of characters and events. For the first time in the career, the album was recorded in its entirety in English. The soundtrack was released in 1984 as Legend and won the band a BAFTA award for Best Original Television Music, the first Irish band to win it. In 2003, Clannad revealed that there were other pieces recorded for the third series of Robin of Sherwood that were not included on Legend, yet the master recordings have yet to be found. In 1985, Clannad released Macalla (Irish for Echo) which was recorded in Switzerland, England, and Ireland. It contained all original material except one traditional song and yielded the group a hit single "In a Lifetime", a duet with U2 singer Bono which begins with Máire being heard teaching Gaelic to Bono during the introduction. The album features numerous backing musicians who have continued to tour with them, including ex-King Crimson saxophonist Mel Collins, Moving Hearts' guitarist Anthony Drennan, and drummer Paul Moran. Also on board was producer Steve Nye, who oversaw the pop-flavoured "Closer to Your Heart" and the ballad "Almost Seems (Too Late to Turn)" and became hit singles, the latter serving as the Children in Need charity single in 1985. Sirius was released by RCA in 1988 and was recorded in Los Angeles with rock producers Greg Ladanyi and Russ Kunkel, the drummer for James Taylor's band. The album included a duet with Bruce Hornsby and guest appearances by Steve Perry and J.D. Souther. The title track was Pól's encouraging call to the environmental movement, and to the Greenpeace ship of the same name. "Something to Believe In" features Hornsby on vocals and keyboards. Completed with the help of some of the biggest names on the Californian rock scene, Sirius was another different creation, just like their previous 3 albums. Received with critical apprehension, Sirius was initially, stoutly defended by the band as a change, but since then members have expressed their disappointment with the album. In 1989, Clannad embarked on their first worldwide tour. Past Present RCA, which to date is the only "greatest hits" compilation so far by the band to include any new tracks: "The Hunter" and "World of Difference". This album also included tracks from Magical Ring, Macalla, and Sirius. The Collection k-Tel, re-released in 1996 under the label's Celtic Collections series. Unlike Past Present however, it also included five earlier tracks from their more traditional Irish period. Pól initially left the group to pursue a solo career and work with the WOMAD (World of Music, Arts and Dance) organisation in Britain. He released a trio album in 1993 with Guo Yue and Joji Hirota under the new name Trísan. The true reason for Pól's departure is unknown; being a family band, very little information is released about personal and professional relations about and between the members. Pól rejoined the band in January 2011, when Clannad performed at Temple Bar TradFest. Initially a single concert, it was extended with an extra two nights. The four-piece Clannad as a quartet in London, March 2008. After Pól's exit, Clannad continued as a quartet and recorded Anam (Irish for Soul) in Dublin and England. It marked a return to their sound heard on Magical Ring and Macalla, and features greater contributions from Ciarán who is credited as a writer on nine of the album's ten original songs. The US edition, released in 1992, features "In a Lifetime" with Bono and "Theme from Harry's Game", which had been included in the film Patriot Games and a Volkswagen television advert, boosting the group's recognition in the country. The latter won a Billboard Music Award for World Music Song of the Year. Clannad dedicated "Rí na Cruinne", the opening track, was included on the One World One Voice charity album to raise awareness of environmental issues. In 1991, Clannad released a duet with Paul Young, a cover version of the Joni Mitchell song "Both Sides Now". The track had been put together for the Blake Edwards film Switch, featuring Ellen Barkin. In the storyline, a nasty male chauvinist, is reincarnated as an attractive female. The use of the Joni Mitchell song was therefore suitable and proved a hit for the group. Released in 1993, Banba became Clannad's 13th studio album and received rave reviews and the band's first Grammy nomination. The album jogged comfortably to the number one spot in the World Music Chart. Banba is a romantic mythical name for Ireland. In the track "I Will Find You," written especially for the film The Last of the Mohicans, Máire sings in English, Mohican and Cherokee. Once again all the songs were written and produced by Ciarán Brennan, except "Sunset Dreams", written by Noel Duggan. Moya Brennan described the album as "a fusion of various styles of music, growing out of a traditional Gaelic root." Banba has been described as one of Clannad's most visual albums, and has sold over 1 million copies to date. One of Clannad's most recognisable songs, from Banba. The album Lore (1996) gave some thought to the Native American Indians. On "Trail of Tears", when Noel Duggan imagines how it felt to be exiled from one's ancestral land, he was also thinking about these people and their connection with the Irish. It opens with "Croí Cróga" ('braveheart' in English) which was written as a theme tune for the Mel Gibson film Braveheart which, for unknown reasons, never made it onto the soundtrack. Lore features American drummer Vinnie Colaiuta and Mel Collins. It contained a strong jazz element, with songs such as "Seanchas" blending contemporary sounds with traditional Irish music and the Irish language. Clannad toured Europe, Japan, Australia, and New Zealand in 1996 to promote the Lore album, but due to apparent disagreements with Atlantic Records, plans to tour the USA were scrapped. In 1996, they received a lifetime achievement award from the Irish recording industry (the IRMA). Clannad returned in 1997 with another album, Landmarks. In the song "Of This Land", Máire sings about Ireland, of its past and of its future. The track "Fadó" (translates as Long Ago), demonstrates the influences of old Celtic history on Clannad's music. It became one of the most celebrated Irish albums in history and in 1999, it won the group a Grammy award for Best New Age Album. In 1999, the group composed the song "What Will I Do" for the Kevin Costner film, Message in a Bottle. Clannad performing at Leo's Tavern in 2005. After Landmarks, Clannad ceased to make any more studio albums, but had promised to return in the near future. In 2003, they released the best of album, The Best of Clannad: In a Lifetime, which is one of their biggest-selling albums to date. In 2005 the two Duggan twins, Noel and Pádraig, as the musical duo The Duggans, got together for the first time outside of Clannad and recorded the album Rubicon. During the 2006 solo tour of Moya Brennan in The Netherlands, the concert in De Doelen, Rotterdam, was dedicated to Leo and Baba Brennan. The whole of Clannad, including former member Pól and sister Deirdre, performed five songs during the second half. The audience, Leo and Baba were unaware of the plan to bring Clannad on-stage, which resulted in multiple standing ovations from the audience. The five original members of Clannad appeared on stage together at the Celtic Connections Festival in Glasgow on 19 January 2007. The concert was greeted by 2,000 fans who travelled from places such as the US and Brazil to see the legendary group perform some of the most loved songs in their history. 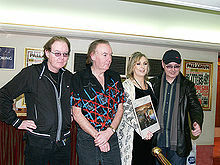 While at the Meteor Ireland Music Awards that were held in Dublin on 1 February 2007 Clannad were presented with the coveted Lifetime Achievement Award. Clannad reform at Celtic Connections festival in Glasgow on 19 January 2007. In March 2008, Clannad began their first UK tour in over 12 years, starting at The Sage in Gateshead. The tour culminated in a dozen dates, including concerts in Ireland and Thailand. In May 2008, Clannad's version of the traditional song "Down by the Sally Gardens" was featured in the listening paper for Music GCSE from the Oxford, Cambridge and RSA Examinations exam board. On 25 August 2008, Clannad released a new compilation album of their early music to contrast the music of their previous compilation album at the beginning of 2008, Beginnings: The Best of the Early Years. In June 2009, Clannad was nominated for an IMA Award in the category Best Revival Act, along with other revived bands Planxty, Moving Hearts, Arcady and Stockton's Wing. In January 2011, Clannad's concert at Christ Church Cathedral TempleBar TradFest in Dublin was extended by two nights due to fast ticket sales. The group appeared on RTÉ's The Late Late Show on 21 January 2011 performing the "Theme from Harry's Game" with choral group Anúna. It was their first appearance on the show in 14 years. On 18 June 2013, Clannad announced that their brand new studio album Nádúr (their first new album since the release of Landmarks in 1998) was to be released worldwide in September 2013. An international tour commenced in October 2013 starting in Australia and New Zealand. When Clannad first started out in the early 1970s their music and sound stemmed solely from their traditional background. Despite this they managed to popularise such old songs as "Dúlamán", "Teidhir Abhaile Riú" and "Coinleach Glas An Fhómhair", and these songs have remained popular numbers at their concerts. On the departure from their folk and traditional background in 1982, they created a new sound that would define the meaning of new-age and Celtic music forever. When "Theme from Harry's Game" and "Newgrange" were first heard, radio stations all over the world became fascinated by the earthly and spiritual sound that they had never encountered before. One critic said "the tunes were seeped in the old ways, but the production and the arrangement was fresh and inventive". This transition in Clannad's career is often seen as the birth of Celtic music, and to this day they are regarded as the pioneers of that genre. They are also noted for their melodious harmonies, which have been at the heart of their music since their first album. Legend (1984) was based on English folklore. With later albums, Clannad delved further into the realms of electronica and even pop. Due to this, many of their singles entered pop charts all over the world, and widened their fan base once again. Despite their success with this genre of music, the group managed to maintain a link with their Gaelic roots throughout their career, giving traditional Irish songs such as "Tráthnóna Beag Aréir" and "Buachaill Ón Éirne" the Clannad treatment. Even though the rock-infused Sirius and the pop-inclined Macalla were successful for Clannad, it was their breakthrough style that they created themselves that has left the greatest legacy. Clannad's influence can be found in the film Titanic, where James Horner admitted to basing the soundtrack on Clannad's style. The soundtrack was so like Clannad's work that it has been incorrectly credited to them for many years. Clannad's 'Celtic mysticism' is a recurring theme in the film Intermission. The "otherworldly" and "ethereal" Clannad sound comes from the ancient hills and glens that surround Gweedore, according to lead singer Moya Brennan. Traces of Clannad's legacy can be heard in the music of many artists, including Enya, Altan, Capercaillie, The Corrs, Loreena McKennitt, Anúna, Riverdance, Órla Fallon and even U2. Bono stated that Moya has "one of the greatest voices the human ear has ever experienced". The private life of lead member Moya was detailed in her autobiography in 2000. In it, Brennan recalls her upbringing as the eldest of nine siblings in rural County Donegal, Ireland. Along with the highs of success in the music business, she also recounts low periods where alcohol, drugs and an abortion made her re-evaluate her life. She emerged from dark years as a committed Christian with rekindled faith. She remarried in 1991 (having previously been married to a Dublin musician) and now resides in Dublin with her husband, photographer Tim Jarvis, and children, Aisling and Paul. The Brennans are Ireland's most successful music family, with combined sales of over 90 million records. Máire (or Baba) Duggan and Leo Brennan are the parents of the Brennan siblings Máire (or Moya), Leon, Ciarán, Deirdre, Pól, Olive, Eithne (or Enya), Bartley, and Brídín. Baba was the local school's music teacher and Leo led the celebrated Slieve Foy show band. The catalyst that would propel the entire family onto the stage was the opening of Leo's Tavern in 1968 in Meenaleck, Co. Donegal. This pub has become a musical Mecca over the years, and Bono and Paul Brady have even been known to join in the regular jamming sessions. The other six children can all sing and play one or more instruments—Olive and Deirdre have sung on Moya's solo albums and Brídín, who for years toured with Clannad as a backing vocalist, has released a solo record, Eyes of Innocence. Enya is also Ireland's best selling solo artist, earning international success. Máire 'Baba' Duggan is currently the lead member of the local Catholic choir, Cór Mhuire Doire Beaga, but no longer continues to teach in the local community school Pobalscoil Ghaoth Dobhair. The choir has been frequently joined by Leo Brennan and the Brennan siblings. Leo Brennan died on 22 June 2016 (age 90) at his home at Upper Dore, Gweedore in West Donegal, Ireland. 1982: 1982 Ivor Novello Awards, Best Soundtrack for "Theme From Harry's Game"
1984: 1984 BAFTA Awards, Best Television Music for "Robin of Sherwood"
1992: Billboard Music Award, World Music Song of the Year for "Rí na Cruinne"
1999: Grammy Awards of 1999, Best New Age Album for "Landmarks"
1982: 1982 BAFTA Awards, Best Television Music for "Harry's Game"
1994: Grammy Awards of 1994, Best New Age Album for "Banba"
1996: Grammy Awards of 1996, Best New Age Album for "Lore"
^ "University of Ulster News Release – UU To Honour Peacemaker Tutu". News.ulster.ac.uk. Archived from the original on 16 October 2011. Retrieved 7 May 2012. ^ "Clannad - News, Photos, Videos, Bio. Free music downloads at MP3.com". ^ "Clannad's Nádúr and Other New Celtic Recordings". The Huffington Post. 26 August 2013. Retrieved 22 September 2014. ^ Moser, Margaret; Fri.; 21, June; 2002. "Chieftains, Clannad". ^ "Maire Brennan Interview". Rootsworld.com. Retrieved 22 March 2012. ^ Moya Brennan. "Biography". Moya Brennan. Retrieved 22 March 2012. ^ "FAQ [alt.music.enya] Frequently Asked Questions (Monthly Posting)". Faqs.org. Retrieved 22 March 2012. ^ "Clannad Facts, information, pictures | Encyclopedia.com articles about Clannad". Encyclopedia.com. Retrieved 22 March 2012. ^ "Capital Celtic Network - CLANNAD". ^ Kurt Loder (3 January 1980). ""Rolling Stone" column". St. Petersburg Times. p. 17D. Retrieved 22 March 2012. ^ "Clannad.ie". Clannad.ie. Archived from the original on 27 October 2014. Retrieved 22 September 2014. ^ Ed. "More Clannad Concerts Including Pól Brennan". Clannad.nl. Archived from the original on 11 November 2013. Retrieved 22 September 2014. ^ "The Clannad Newsblog". Archived from the original on 17 November 2007. ^ "New Clannad Compilation Confirmed – Northern Skyline". Clannad.org.uk. Archived from the original on 13 February 2012. Retrieved 22 September 2014. ^ "Clannad & Enya Nominated for IMA's!". Clannad.org.uk. Archived from the original on 26 May 2011. Retrieved 22 September 2014. ^ "Profile: Clannad". Archived from the original on 17 October 2015. Retrieved 22 September 2014. ^ "Clannad Website / News (18 June 2013)". Clannad.ie. Archived from the original on 14 December 2014. Retrieved 22 September 2014. ^ "Clannad Interview and Article Library". Clannad.org.uk. Archived from the original on 30 March 2009. Retrieved 22 September 2014. ^ "Clannad's 'Earthly' style". Uk.real.com. Retrieved 22 September 2014. ^ "Titanic". Filmtracks.com. Retrieved 22 September 2014. ^ "Lynch uncovers his hardnosed relish for the nastier aspects of police work and his softer side too, deriving much pleasure through listening to Irish folk acts such as Clannad in his unmarked police car!". Futuremovies.co.uk. Retrieved 22 September 2014. ^ "Entertainment News". The Celtic Connection. Archived from the original on 19 January 2013. Retrieved 7 May 2012. ^ "Get Ready for the Return of Moya Brennan And Clannad". Irish Examiner USA. 13 March 2012. Retrieved 7 May 2012. ^ Ecomsolutions of NY. http://www.ecomsolutions.net (1 June 2006). "World Music Features The Corrs World Music at Global Rhythm – The Destination for World Music". Globalrhythm.net. Retrieved 22 March 2012. ^ michaelmcglynn (7 October 2009). "The Free Design and Clannad « Michael McGlynn". Michaelmcglynn.wordpress.com. Archived from the original on 16 March 2012. Retrieved 22 March 2012. ^ "Home – Real Good Music". Rgmbooking.com. Retrieved 7 May 2012. ^ "CBNmusic -- Moya Brennan: Her Prince, Her Peace, and Her Praise". ^ "SADNESS AS FATHER OF FAMOUS CLANNAD CLAN PASSES AWAY". donegaldaily.com. 22 June 2016. Retrieved 22 June 2016. "The Theme from Harry's Game"
"Almost Seems (Too Late to Turn)"
"White Is in the Winter Night"